… minutes later Captain Thomas F Mantell was dead! On 7th January 1948, residents of Maysville, Owensboro and Irvington, Kentucky started reporting a UFO to their police. The police reported this to the Military officials at Godman Air Force Base (close to Louisville). The ATC tower at Goodman AFB checked with other installations and discovered that there were no official or unofficial flights in the area. They started scanning the sky and at 1:45pm they too saw the UFO. They immediately recognised that it was not a weather balloon or aircraft that they recognised. It was large, silvery, somewhat cone-shaped with a red base. At 2:20 PM a flight of four F-51D aircraft approached Godman en-route from Marietta AFB to Standiford AFB. The flight, led by Captain Mantell, was requested by the Godman tower to investigate the object. What happened next is still very much open for debate but the planes set off to intercept the object. One aircraft broke off from the investigation due to low fuel levels. According to the official story, Mantell pulled ahead of his two wingmen who were forced to turn back due to a lack of high altitude oxygen equipment. 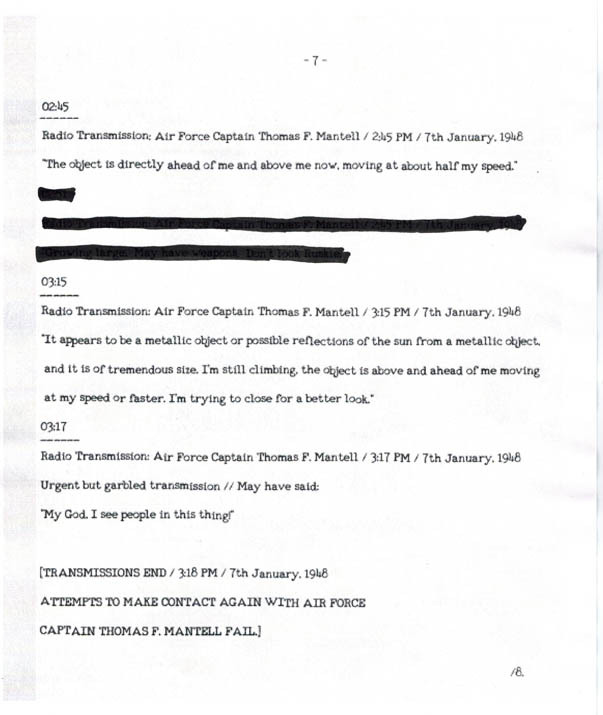 At 14,000 feet Mantell reported, “The object is directly ahead of me and above me now, moving at about half my speed.” Around 3:15 some of the tower crew thought they heard Mantell say, “It appears to be a metallic object or possible reflections of sun from a metallic object, and it is of tremendous size. I’m still climbing, the object is above and ahead of me moving at my speed or faster. I’m trying to close for a better look.” Further communications at 03:17 were garbled although some listeners claim they heard Mantell say: My God, I see people in this thing. After this point contact was lost and it seems that the Mustang suddenly went into a steep dive and, after partially breaking up during the descent, it crashed into the field of a farm some five miles South of Franklin, Kentucky. Mantell’s body was removed from the aircraft wreckage by fire fighters and taken to the mortuary by ambulance. The newspapers and media printed sensational stories involving aliens, death rays and radiation – all of which were denied by the Air Force and other government officials. The official story was that everyone had mistaken the planet Venus for a UFO and Mantell had taken his aircraft to an unsafe height beyond 25,000ft and had passed out from lack of oxygen. Case closed!? 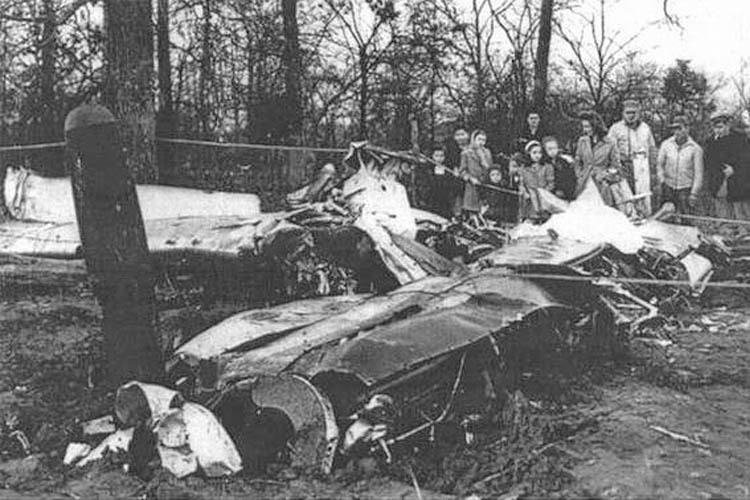 The Mantell Incident – Plane Crash. But what about the UFO? Back in 1948 researchers were severely restricted by two factors: A) Authorities were general believed and trusted B) There was no internet to allow for rapid information gathering and cross-referencing. It’s not surprising then that when the media were told the UFO was just the planet Venus they – by and large – meekly accepted this answer. FACT: The UFO could not have been Venus! 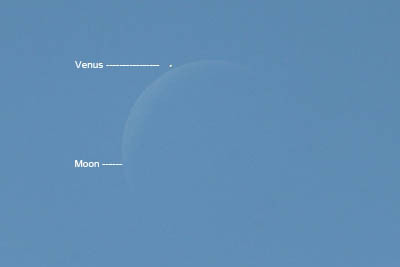 At the time of the incident, Venus was indeed roughly in the correct location. However, the planet simply didn’t reflect enough light at this time of the year to be mistaken for anything like what the witnesses described. Venus would have been just another a pinprick of light in the sky. This ‘Venus’ phenomenon has never again been witnessed in the region even though more than six decades have passed. In addition, Dr. Hyneck who wrote the original report actually stated later that he did not believe the UFO was Venus. Perhaps the authorities realised that the Venus explanation was somewhat weak and later suggested it was a weather balloon. For some time after this statement there was confusion with some spokespersons still sticking to the Venus version of events. In the end, people seemed to broadly accept that it was one or the other. After many years had passed, a secret project known as Skyhook came to light. This involved using large, roughly cone-shaped, balloons to send monitoring equipment high into the atmosphere. Superficially this sounded like the solution and – once again – case closed. FACT: The chances that the Mantell UFO was a Skyhook balloon are remote! 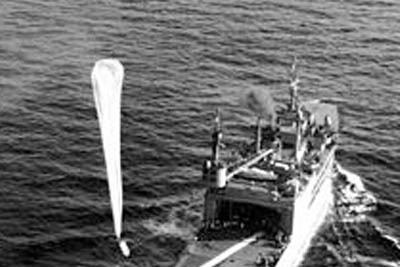 The witnesses at Godman Tower, many of whom were senior military personal and studied the object through powerful binoculars, clearly stated that the object was NOT a balloon. The object changed colour and had a red base. The skyhook balloons had neither of these attributes. No record has ever been located that a Skyhook balloon was launched anywhere near where the event took place. While Skyhook balloons are very large they are also extremely elongated making then quite narrow and hard to see at a distance. To create the effect described by witnesses would mean that every person viewed the ‘balloon’ from precisely the same angle and altitude. The chances of this happening are minuscule. In addition, astronomical records indicated that Venus was only 33 degrees above the horizon at the time of the incident and not the 45 degrees associated with the phenomenon. FACT: Sundogs … not likely! 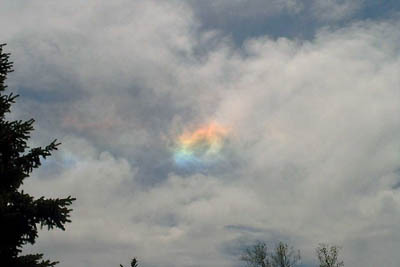 Professor Donald Menzel offered the suggestion that the phenomenon was a parhelion effect more commonly known as a sundog. These occur when sunlight is reflected off ice crystals high in the atmosphere. As with the Skyhook balloon, this would mean that ever person that observed the UFO would have had to view it from exactly the same angle. This did not happen. In addition, as Mantell’s plane changed height and viewpoint it would have become immediately obvious that he was chasing a sundog. This did not happen either. Sundogs … not likely! Skyhook balloon and launch ship. Dramatic example of a sundog – one of the most impressive for colours. 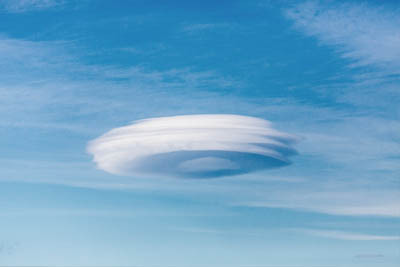 A single lenticular cloud in the typical saucer-shape that has triggered many UFO reports. FACT: It was not a lenticular cloud! There has been extensive speculation that the UFO sighted by the personal of Godman Tower was actually a lenticular cloud and weather reports indicate that there were clouds in the sky. However, both the pilots and the ground personnel would have recognised a lenticular cloud. In addition, The UFO described by witnesses bears little if any resemblance to this well-known weather phenomenon. So … If the aerial phenomenon seen by so many witnesses was not Venus, a balloon, a cloud or even a sundog then what was it? S0 WHAT WAS THE MANTELL UFO / UAP*? An Alien Ship of Some Kind? This is by far the most popular proposal. The theory goes that aliens and their spaceships have been monitoring activity on planet Earth for quite some time. Their ships – observation stations – are invisible to both sight and radar thanks to highly sophisticated but temperamental technology. This is not as farfetched as it may sound. However, from time-to-time, their technology fails (as all technology does) and their craft becomes visible. It is these technical failures that account for many of the UFO sightings witnessed every year. It is proposed that this is what happened in the Mantell case. Captain Mantell did see an alien spacecraft and tried to reach it but it was at too high an altitude causing him to pass out from lack of oxygen and lose his life in the ensuing plane crash. 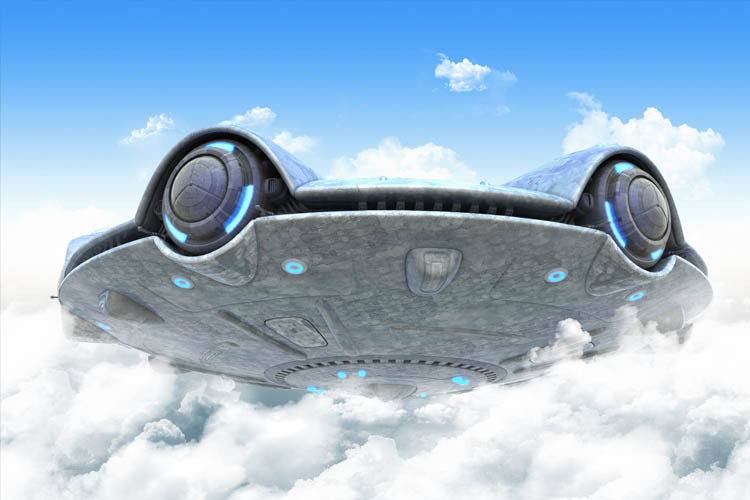 The Mantell Incident – Was there a real Alien UFO? Many researchers of the Mantell UFO Incident believe that the object was an advanced type of military aircraft – the details of which have never been released. In particular, they suggest that it may have been a form of high altitude airship based on a circular version of the 1945 K-class blimps and German WWI Zeppelins. Some have even speculated that these were to be aerial forts permanently aloft and designed to intercept incoming enemy bombers including future nuclear bombers. It is worth noting that the first Russian nuclear test explosion took place on the 29th August 1949 – the year after the Mantel Incident. One suggestion is that a portal through time briefly existed over the region and the witnesses were able to see future aircraft. Worth mentioning but not likely. A Weapons Test – Project Harp? Since conspiracy theories started appearing on the internet there has been speculation that the USA has been developing a way to control the weather and use it as a weapon. In 1990 the US government funded the High-Frequency Active Auroral Research Program (HAARP). This was said to be jointly funded by the U.S. Air Force, the U.S. Navy, the University of Alaska and the Defence Advanced Research Projects Agency (DARPA). The most prominent instrument at the HAARP Station is the Ionospheric Research Instrument (IRI), a high-power radio frequency transmitter facility operating in the high frequency (HF) band. Some investigators believe that HAARP is a cover for a weather weapon programme. They also suggest that this research has been active since NAZI scientists were relocated to the US as part of Operation Paperclip. They have further suggested that the phenomenon witnessed as part of the Mantell Incident was actually a weather control experiment.